Yesterday, I joined the Liberal Democrats. For anyone who knew me in 2010, I’m sure this will come as quite a surprise. In the five years between 2008 and 2013, I I went from having undeveloped, contrarian political understanding through to disillusion agorist. From assuming Cameroon to Thatcherite, through to classical liberal, then libertarian. Before my year as a member of Conservative Future ended, I had already grown tired of the party. Activists I had met and befriended were all heading to Ukip. After seeing Olly Neville get sacked by their chairman for supporting gay marriage, it seemed their claim to be a home for libertarians was untenable. Until around March this year, I wasn’t going to vote. If you’re a right-libertarian, it’s pretty hard to try and find a political party to call home. 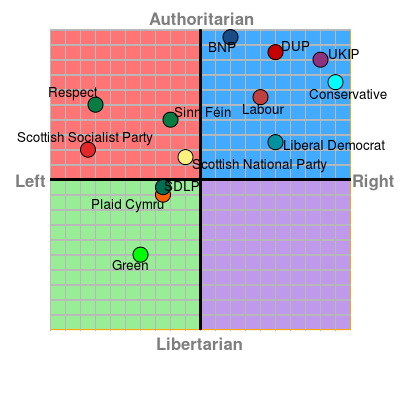 In 2015, absolutely no parties sat in the quadrant of the graph where I sit. I did realise, however, that the economic argument had moved in the right direction. My disillusionment with politics over the past five years thought that even if the Tories, Labour or even Lib Dems had won a majority in 2010 fiscally, the country wouldn’t have been too different. As opposed to say, if the Greens had ruled during that period. Socially, however, there is still an awfully lot to be done. Where was the market liberal voice pointing out that immigration was a net positive for the country? (https://www.ucl.ac.uk/news/news-articles/1114/051114-economic-impact-EU-immigration) Party policy followed the scaremongering. On drugs, we look to America and are frankly amazed. Here is a country with higher social conservatism across many swathes of the nation than we have here, and yet a number of states have now legalised cannabis. Thousands die each year due to the global war on drugs. Dozens are being killed in the UK by PMA tablets, whom almost certainly would have been alive if a regulated market sold them the ecstasy that they were expecting rather than this deadly precursor. All the while, the addicted – those who need our help unequivocally – are treated as criminals rather than patients. And on civil liberties, we now look like we will face five years of continual decline. In 2009, I remember fondly the Tories and Lib Dems in opposition lambast Labour for the nanny state, the reduction in our rights and the war against civil liberties created in the name of counter-terrorism. The coalition’s record on civil liberties was nowhere close to where it should have been, but at least the Liberal Democrats had a strong influence. Now, decoupled from the Liberal Democrats, Theresa May is in a frightening position in the home office. The snoopers charter will get rushed through. More anti-terror laws, which sign away our personal liberties and freedom, will no doubt be passed. Less than 24 hours after the announcement of a Tory majority, Theresa May revealed the quick fire decision to reignite the snoopers charter now that the brakes are off. I don’t imagine her decision making on such matters in the future to take any longer. The party I found myself voting for on Thursday was the Liberal Democrats. It was something that almost until election day I debated. But was happy to have made the decision when I did. Nick Clegg’s resignation speech was one of the best political speeches I’ve seen in recent years. A perfect blend of humility with defiance. We were reminded that if it had not been for the Lib Dems, the country would have certainly been worse off over the last five years. It frustrated me their decimation in the polls and the Commons. I was never a Lib Dem before, nor did I ever support their pledge on tuition fees. But when I look at those who did, I cannot believe it. For a party who had less than 1/10th of the seats in 2010, they certainly had a great deal more than 1/10th of the influence in government. The Liberal Democrats now are at a point where support is needed. There will be those who now say that a lurch to the left is necessary. That the Orange Book should be forgotten. That getting into bed with the Tories was what killed us. I think they are all wrong. I am excited to see where the Liberal Democrats can go from here. We are an intellectual party. One that should be shouting from the rooftops that the status quo is wrong on so many things. A party of thinkers that has deep ideological roots. A party that could shape a genuine alternative for market and social liberalism. One that gives responsibility and power back to the individual, entrusting them with their own lives, yet supporting them to do so. Philosophy in party politics is all but dead today, what if we had a chance to change that? I am indeed a very new Liberal Democrat, but I finally am beginning to feel like I have found a home. If you have recently joined the Lib Dems as well, I am co-organising a newbie London Lib Dem meetup here. This was a great read, thank you. A measured reflection with valued optimism. Personally I’m still sitting somewhere between the Lib Dems and the Greens – the majority of the Greens’ values resound with me, however they are a nascent and less experienced party by comparison. Last time round I voted Lib Dems and have the impression they have done a good job during the coalition (although the changes to tuition fees was certainly a huge blow in terms of confidence, that will likely haunt them into the future).